The Mold Free® staff has credentials that can only be acquired through years of education and experience. Our chief medical director, Dr. Samuel Abramson, is a practicing physician, board- certified in pediatrics. He has extensive experience in microbiology and allergy treatment. He was awarded his M.D. from Wayne State University School of Medicine in 1968 and has served on the staff at Children's Hospital of Michigan, St. John Hospital, Holy Cross Hospital, Hutzel Hospital, Cottage Hospital, Bon Secours Hospital, Beaumont Hospital, St. Joseph's Hospital, South Macomb Hospital, St. Joseph on the Boulevard Hospital and Crittenton Hospital. Dr. Abramson is a Fellow of the American Academy of Pediatrics. He has been in private medical practice for over thirty (30) years in pediatrics and adult general medicine. Mold Free®’s President, Edward P. Malone, was awarded his Bachelors degree in chemistry and Masters degree in Physiology from Miami University. Prior to specializing in Mold Inspections and Remediation, Mr. Malone owned and operated Allied Diagnostic Services, Inc., a major independent clinical laboratory serving physicians, hospitals, insurance companies and corporations throughout Michigan and Ohio. Mr. Malone was the founder and President of Immunoassay Corporation, a manufacturer of in vitro test kits that were labeled with radioactive isotopes. These kits were sold to hospitals, laboratories and clinics throughout the United States and Europe. He designed and instituted the first in-house radio-immunoassay laboratory in a Michigan hospital. Mr. Malone lectured for the Nuclear Medical Society. 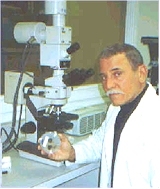 Mr. Malone's credentials include: American Chemical Association; Michigan Chemical Council; EPA Quality Assurance Program; licensed under the Centers for Disease Control; United States Drug Enforcement Administration; United States Nuclear Regulatory Commission; Michigan Board of Pharmacy; Food and Drug Administration; and United States patent holder. For the last twelve (12) years he has focused exclusively on mold research, detection and remediation. Mr. Malone is also a member of the American Conference of Governmental Industrial Hygienists. Click here to view the National Association of Mold Professional (NAMP) Advisory to the Public about the Mold Inspection industry.